You don't need a "vision problem" to need a lighted reading magnifier. 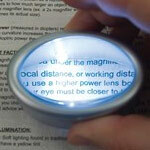 Magnifiers can be a godsend for all of us who find it challenging to decipher small print. While they are obviously ideal for the visually impaired, they are wonderful for all of us as we age. 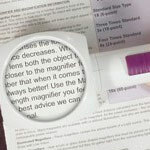 Almost everyone who is middle-aged and over 40 years old would benefit from an illuminated magnifier. As our eyes age, their internal lenses become less flexible, making it more difficult to focus; also the pupils become smaller and need more light. The older we get, the greater our visual abilities diminish, so this is an ideal gift for older moms and dads, as well as grandparents. It would be great if "they" gave out LED Lighted Magnifiers with our first Social Security check, but since they don't, it's fortunate that MaxiAids offers a variety of helpful solutions for low vision. 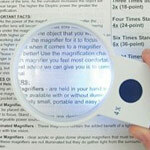 When shopping for a lighted magnifier, keep in mind that the higher the magnification, the smaller area that you can see. So choosing the strongest magnification will not automatically make a magnifier the best choice for your needs. A magnifier with light is terrific for so many real-world situations: reading menus in dimly lit restaurants; reading the tiny instructions on both pill bottles and microwave-ready frozen food; navigating with a map; decoding the fine print on bus and train schedules; shopping in the store for clothing with tiny price tags and cleaning instructions. For some loved ones who are vision impaired, a lighted reading magnifier might be the magic key to unlock the barrier blocking the way to reading all those wonderful books sitting patiently on the shelf, waiting to be read. Handheld Magnifiers: Lightweight and compact, handheld lighted reading magnifiers are probably the most popular and ubiquitous illuminated magnifiers of all. Their ease of use and convenient portability often make them the constant companion of the visually impaired, whether they are at home checking their mail, out shopping, ordering a meal in a restaurant, or traveling. A handheld magnifier with light is also a favorite tool for many hobbyists and collectors. Whether examining coins, stamps, butterflies, jewelry, or fountain pen nibs, these wonderful devices allow you to see every detail. While not generally suited for extended reading sessions because of their limited field of view, they are ideal to read groups of just a few words each. Perfect for menus, pill bottles, or clothes labels but not the best choice to read a 1,000+ page novel like Stephen King's "The Stand" or Tolstoy's "War and Peace." However, a handheld lighted magnifier might be just right to read a verse or two from the Bible or an Emily Dickinson poem (but not Walt Whitman's Leaves of Grass). Stand Magnifiers: Lighted reading magnifiers with a built-in stand lack easy portability because of their heavier weight and bulkier configurations. However, they provide brighter illumination, longer battery life, and their physically larger lenses provide a wider optical field of vision. Their design allows positioning the magnifier directly above your reading material. Available in a number of designs, their legs provide a magnified view with hands-free support. 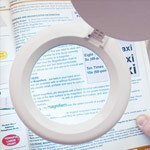 Stand magnifiers make reading longer works much easier and far more pleasurable. Dome Magnifiers: For reading sections of documents with small print and tiny details on a flat surface such as a desktop or table, a dome lighted reading magnifier is king. Many find it so useful to have at hand, it probably deserves a place on every desk, where it can serve as a paper weight when not being used to read. Small print books like the old Oxford English Dictionary and pocket-size Bibles are able to be read with relative ease as the dome magnifier rests on the page. Blue prints, technical schematics and drawings, details on maps, miniscule knitting patterns, etc. come into focus under an illuminated dome magnifier. Have you tried to read the lyrics and liner notes that come with Compact Discs lately? The size of the type on CD booklets has been shrunk to Lilliputian dimensions. They are virtually unreadable without magnification. For low vision seniors, reading the morning newspaper at the kitchen table can finally become a pleasure again with the help of a dome-style reading magnifier with LED light. Magnifying Lamps: Hands-free lighted reading magnifiers, configured as magnifying lamps, are available in a variety of design styles. Whether they have a flexible goose neck or rigid articulating arm attached to a pedestal or clamp, they are a useful tool for the hobbyist or professional engaged in precise assembly, careful examination, inspecting, repair, as well as detailed creative work. Illuminated reading magnifier lamps are perfect for jewelry work; watch and electronic repairs; sewing; knitting; small model work; projects requiring fine detail painting; product assembly; electronics inspection; and reading documents and books.